While on holiday leave from the army, chareidi soldiers from the Netzach Yehuda Brigade chose to devote their long-awaited vacation day to visiting the sick in hospitals around Israel and delivering festive mishloach manos to them. The soldiers visited Hadassah Ein Kerem and Shaare Zedek Hospitals in Jerusalem, Sheba-Tel Hashomer in Tel Aviv and HaEmek in Afula, as well as several nursing homes in small towns and cities around the country. In the framework of the Netzach Danielle Project established in memory of Danielle Sonnenfeld, a”h, 2000 mishloach manos packages were delivered to the elderly, ill and disabled around Israel. 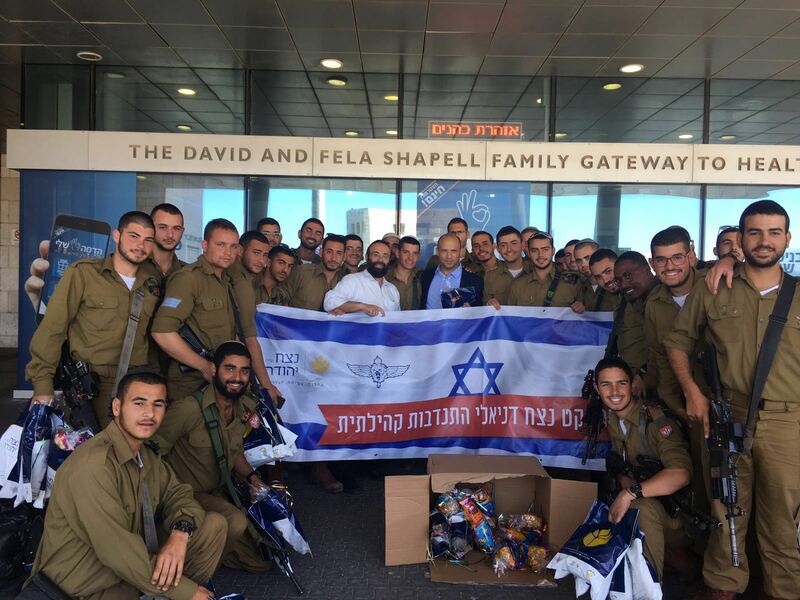 While distributing the packages in Hadassah Ein Kerem Hospital, the soldiers were treated to a visit by Minister of Education Naftali Bennett who expressed his Purim greetings to the soldiers and wished them all the best. The volunteer-based Netzach Danielle project is the initiative of the Nachal Chareidi Organization which escorts chareidi soldiers throughout their years of military service and beyond. The mishloach manos were the gift of the Danielle Foundation, founded by Mr. Moti Sonnenfeld in memory of his beloved daughter Danielle, a”h, who was killed three years ago on this day in a tragic car accident while returning home from volunteering in the oncology ward at Schneider’s Children’s Hospital.